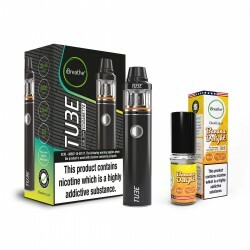 Funky Juice is a brand-new range of e-liquids by iBreathe. They have been crafted with precision, to be richer & fuller in flavour and to cater for a wide taste palate. Available in large 50ml bottles and Nic Shot ready, Funky Juice has been designed with the recreational vaper in mind. Formulated using 70% vegetable glycerol (VG) and 30% propylene glycol (PG), the high VG content produces large volumes of vapour clouds. Funky Juice is suited for use with coil resistances lower than 1.0 Ohm. For optimum performance, a coil resistance between 0.15 - 0.5 Ohm is recommended. Each Funky Juice flavour comes in a large 50ml bottle. That’s fives times more e-liquid than a traditional 10ml bottle, offering you the best value for money. Available in 5 unique flavours, you won’t find an e-liquid that tastes the same as Funky Juice. If you love your sweet & aromatic flavours, Magic Mango is the one for you. For the fruit fans, you can’t go wrong with the trio of strawberry, orange & blackcurrant in S.O.B. Fancy a refreshing & tangy vape? Then look no further than Lemon Crush and Twisted Apple. And let’s not forget the menthol fans - Tropical Freeze offers an icy inhale with a fruity twist. Funky Juice does not contain any nicotine. For those who require a nicotine hit, simply add a 10ml iBreathe Nic Shot to your Funky Juice. Adding a 10ml Nic Shot to a 50ml Funky Juice will provide a finished nicotine strength of 3mg/ml. Click here for iBreathe Nic Shot. 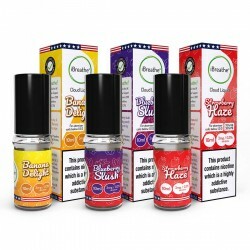 3 Pack 10ml High PG Premium E-LiquidiBreathe has been at the forefront of the electronic cigarette i..
Abracadabra and voila! A mango menthol magic moment Funky Juice is a brand-new range of e-liquids..
Tube Sub-Ohm E-Cigarette & 10ml Cloud Liquid Power and simplicity combined in an ultra-sleek ..